Coordinating a global shipment requires aligning many operations in advance. One activity involves moving the product from the arrival port to the next destination as quickly as possible after customs clearance to avoid unnecessary demurrage charges. Transferring a shipping container from the port to the next location, perhaps a railyard requires a reliable drayage service. The term “dray” evolves from the nineteenth-century use of a dray or horse-drawn cart to transport goods short distances from a canal or railroad terminal to a local destination. Even today, the drayage portion of the cargo journey is usually very short and mostly pertains to international container shipments. Other drayage circumstances involve transporting containers from one port to another or to a trucking terminal to begin the final leg of a journey to the destination. Sometimes drayage means moving the container from a port to a nearby distribution center or directly to a nearby consignee. Moving cargo from an inland European factory to an inland United States destination, or the opposite, involves coordination among many different entities and complex documentation. In simplest terms, the shipment will travel by land to a port, then onto a ship (or airplane) to cross the ocean to a port of entry. After arrival and customs clearance, the shipment proceeds by land transport to the first destination. In a somewhat more complicated scenario, a container may contain a mixed load destined for multiple locations. In this instance, the drayage company may transport the shipping unit to a cross-docking warehouse where the cargo is split into smaller shipments for further distribution. 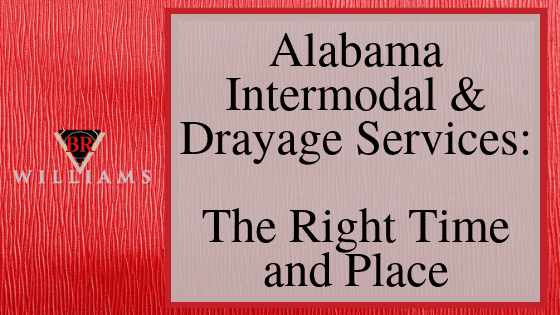 With over 60 years experience in freight and supply chain management, Alabama-based BR Williams Company has established a multi-purpose distribution center or warehouse near the busy port of Mobile. The staff, equipment, and facility are positioned there expressly to accommodate the shortage of drayage facilities at the Port and to provide a low-cost and highly efficient option for importers and exporters. For Exporters: The Mobile BR Williams facility can receive palletized products from anywhere in the country, cross-dock the products, and reload into shipping containers. The container will be transported as scheduled to the Port of Mobile to be loaded onto the ship. For Importers: After a container has arrived at the Mobile Port, cleared customs, BR Williams will provide drayage service to bring the shipment to their facility for cross-docking and redistribution. Alternatively, BR Williams Drayage Services will transport the container to any other nearby designated destination. Container Drayage: Transporting shipping containers to or from the Port of Mobile. The container may be hauled directly to or from an intermodal rail or truck transfer location. 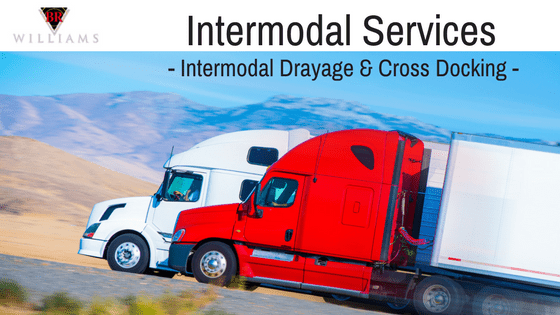 Alternatively, intermodal and drayage require transport to the BR Williams local warehouse for cross-docking or temporary storage. Cross-Docking Warehouse and Services: Cross-docking is either consolidating multiple items into a shipping container for export or unloading an imported shipment for redistribution. Distribution: Distribution services involve loading and delivering goods to the individual customers and destinations. LCL Consolidation: LCL or Less-Than-Container Load consolidation is the process of filling a container with multiple items to optimize freight cost. Logistics managers often combine smaller quantities of unrelated products to achieve the lowest freight-cost-per-unit. BR Williams can manage the LCL consolidations to ensure the products are safely and correctly loaded. Kitting and Packaging: Often products may be sold as “kit” or consolidated SKU. The most freight efficient and practical method may be to bring all components together at a 3rd party location for packaging into a single unit. The process, known as “kitting,” is particularly useful when the elements originate in several far-flung locations. BR Williams accepts these components into our Mobile, AL distribution facility for assembly and packaging per the clients’ instructions. Container Stripping and Stuffing: Stripping means unloading many small consignments from a load. Stuffing is loading a shipping container according to customer instructions. 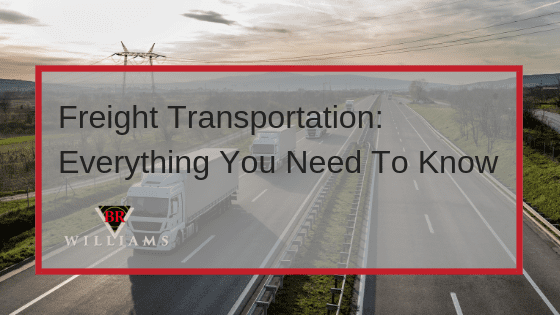 Truck Load Freight Services: For over 60 years, BR Williams has been a premium freight company providing truck-load freight service for world-class companies. Break Bulk Services: Large volumes of a single item can be shipped most efficiently in full containers or truckloads and broken down into smaller delivery units for several customers. In many instances, more than one service may apply to inbound or outbound loads. Because of the full menu of services, shippers and consignees can contract with BR Williams to handle each or all aspects of their intermodal or drayage seamlessly, efficiently, and more cost-effectively than using multiple service providers to accomplish these tasks.